This Project has been completed. Click here for the final completion Report. SRSP was mandated to rehabilitate/develop 659 community managed infrastructure projects and social sector services benefiting over 144,000 households. Under this specific component, SRSP followed a two pronged approach to improve basic social services; a) rehabilitation and improvement of government schemes predominantly in health and education in collaboration with public institutions and b) Identification, implementation and maintenance of productive infrastructure schemes through an active role of local communities. Following this approach, EU-PEACE has initiated and completed 658 infrastructure schemes with a cost of PKR 898 million with public institutions and local communities. This comprised 141 government facilities and 517 communities’ based small scale infrastructure schemes. These infrastructure schemes have enhanced access of 183,964 members to following basic social services in all 7 districts. 28,962 households provided with clean potable water. 21,371 households provided with sanitation facility. 35,483 households provided with an access to link roads. 9,922 households benefitting from irrigation channels. 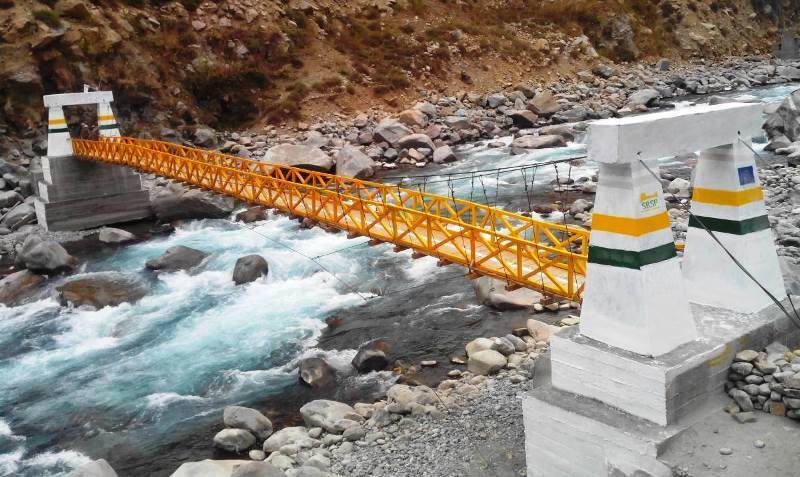 26,528 households provided with an access to RCC- suspension bridges. 52,642 households/children benefitted from improved health/education/agriculture & Other facilities.